Tactical Pest Control is a company of pest control professionals coming together to help protect people and pets from pest threats. Our strategy is simple: help people prevent pest problems before they start! Our company is locally owned and operated in Arizona. We know Arizona bugs and we also know how to get rid of Arizona bugs. Our Promise Protection: The most important aspect of pest control is to keep your home, your pets, and most importantly you and your children protected. We use only EPA Registered pesticides that are labeled for use in and around homes. We also use the least toxic pesticide that is available to control the targeted pest and apply it according to the label. We power spray an exterior barrier all the way around the home to protect it 360 degrees. We spray any and all harborage sites around the home to ensure no pests are setting up their homes around your home. These areas include bases of trees, river rock, underneath and around all plants, water meter boxes, sprinkler boxes, etc. After finishing around the home, we spray all of the columns and bases of your perimeter wall to make sure no pests are climbing or coming through to your back yard. To treat grass areas we have a great water activated chemical that use spread throughout the grass that goes down into the dirt where the bugs live and kill them in their homes. We spray along all of the baseboards on the interior of the home on the initial service to make sure we get all the bugs inside if there are any at the time of first spray. We usually only spray the outside on regular maintenance services but will spray the inside at no additional cost upon request. Termites cost millions of dollars in damage a year to property owners. Termites don’t just attack homes; they infest commercial property as well. It’s in the best interest of every property owner to have your property inspected for termites on a yearly basis. Termite damage is done over time. Severe cases where termites devastate a building didn’t happen overnight. Usually, by the time most people see termite damage, a colony has been living in there for some time. The cellulose that termites feed on is usually the wood and drywood on the skeleton of the building. Since we can’t see the framing of the building, most people are oblivious to termite infestations. This is the most important reason you need to have your property inspected on a regular basis. 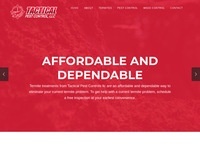 The pest control solutions from Tactical Pest Control llc inspects your property and identifies threats that could allow termites to penetrate your building and build out their colony.